A haze settles on Seattle-Hempfest Weekend is upon us! 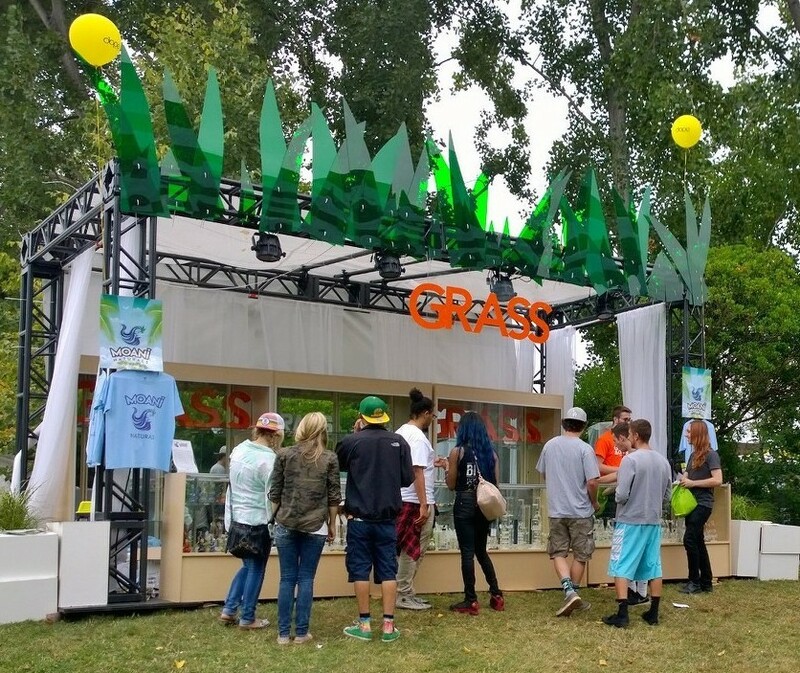 Groovy times on the Seattle waterfront this weekend at Hempfest! We live near the festival so we just had to check it out on our walk home after shopping downtown at two of our favorite stores, World Market and Mud Bay. Thor was needing a big boy diaper so a trip to Mud Bay was required–he’s one year old now and still prone to accidents so on goes the protection until such time as he can control his little self. But enough about Thor’s incontinence and on to a more popular topic, Hempfest! 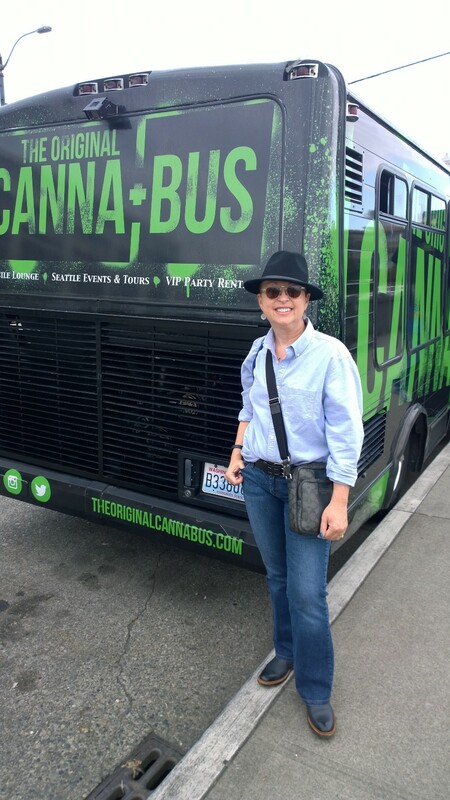 Hop aboard the Canna-bus and take a ride! Guaranteed you’ll smoke a pipe! Trying to avoid the line to herd people into security for bag check, we tried skirting Hempfest crowd to walk along the waterfront. Quickly stopped by a friendly Staffing Pro gal, her supervisor immediately intervened after taking one look at us and waved us by without further ado. Guess we didn’t fit the Hempfest profile and he could instantly ascertain we were just wandering by on our way home with some purchases. Glad to keep on walking (my Fitbit is such a step whore–10,000 or more to be happy!) we quickly fell into the crowd walking as slow as humanly possible so they could smoke, eat and chat while strolling. Amazing how slow you can be when stoned I guess because I was weaving in and out like a madwoman just trying to move along. Seeing the food truck featuring fried PB&J and other fried delicacies was just info overload for their weed-laden brains. Squirrel! “Is weed really legal to just smoke in public?” I innocently asked Thom. He explained that while it is not technically legal to light up in general, there certainly weren’t enough cops in Seattle to enforce any type of law so unless there was trouble, it was pretty much a smokefest of weed in the park. CHILL! The Canna-bus was quite the attraction selling branded apparel and booking events on the weed party bus. Just had to pose for a picture with it. Bet they have to have lots of fridges and microwaves in that bus to crank out the munchies! James just got a pt job with a security company and his first assignment was yesterday in the pouring rain and lightning checking bags at Hempfest for alcohol, which was NOT allowed but a small handful of weed was cool. Interesting standards but at least the crowd was subdued vs. hyped up and crazy. After the worst working day of his life, James crawled home for hot food and rest before another fun day keeping the peace at Hempfest. Jobs like these will help him stay focused on excelling at law school, which he starts next week. I’m super proud he persevered through a ten hour day of Hell. He is surely my son with that type of work ethic! As the haze settles on Seattle, we are looking forward to seeing how Amsterdam embraces their pot culture by comparison to Seattle. We leave in four weeks for our Netherlands adventure and I cannot wait!